Don’t worry we’ll start with the 2015 Ford Mustang review soon, but let’s see what’s so special about the Mustang first. 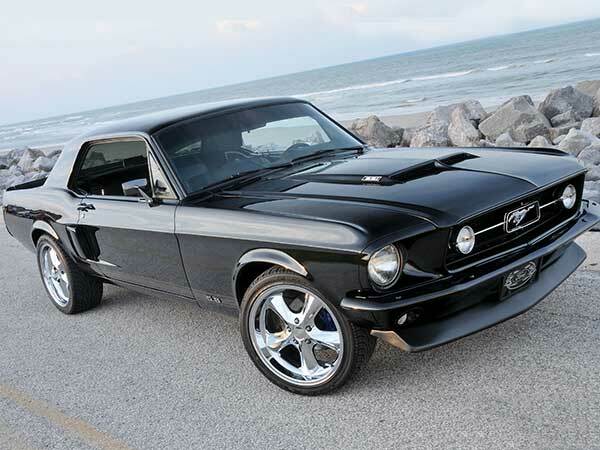 The first Ford Mustang was launched in April 1964 and was later dubbed “1964½” by its fans. The car was available in two models: the coupe and the convertible. Both models featured a lengthened hood and shortened rear deck, chrome wrap-around bumpers, chrome grille and full wheel covers. These became the features of a new class of sport coupes dubbed “pony car”. It is believed that the Mustang served as a source of inspiration for the designs of coupes such as the Toyota Celica and Ford Capri, which were imported to the US. The 1965 Mustang was the first car ever to win the Tiffany Gold Medal for excellence in American design. Furthermore, the Mustang was on the Car and Driver Ten Best list in 1983, 1987, 1988, 2005, 2006 and 2011. After winning the Motor Trend Car of the Year award in 1974 and 1994, the Mustang was runner-up to the Chrysler 300 for the North American Car of the Year award and was named Canadian Car of the Year in 2005. The 2015 Ford Mustang is the car we’ve all been waiting for! This is the sixth generation of the model and I must say that it is a perfect blend of sophistication, sport and safety, which makes it a true luxury sport coupe. With this new model, Ford celebrates 50 years since the original pony car. During this interval, there have only been five generations of completely new Mustangs. This sixth generation is better in every way than its predecessors. It comes with a new independent rear suspension, an enhanced cabin and a new turbo four-cylinder model. It also has new double-ball-joint front suspension, improved pitch control during hard acceleration and hard braking and less body roll, that enhances the overall feel and ride. Additionally, a Selectable Driving Modes system is available. This allows the driver to adjust the car’s steering effort and engine response, as well as select from a number of transmission and stability control settings: normal, snow/wet, sport and track. Other features meant to make every driver’s ride more pleasant are the voice-activated technology and hands-free calling, which allow users to make calls with the sound of their voices, without the need to manipulate a mobile device. They can also plug in their compatible digital music players, USB drives or SD cards and browse their music collection using voice commands. Incoming texts can be read with audible text, so that drivers don’t get distracted while on the road. One of my favourite features is the BLIS (Blind Spot Information System) with Cross-Traffic Alert. This detects a vehicle in the blind spot using radar and alerts the driver with an indicator light in the exterior mirror. The Cross-Traffic Alert also uses radar to detect if there is any traffic behind you while you are backing up. If cross-traffic sensors detect a vehicle approaching from up to 15 yards away, a voice alert will inform the driver. Wondering what’s under the hood? Well, just as with its predecessor, there’s a choice between a 300 horsepower, 3.7-litre V6 or 435 horsepower, 5.0-litre V8, manual or automatic transmissions. But what makes the 2015 generation really special is the 2.3-litre EcoBoost turbocharged and four- cylinder engine that channels 310 horses to the rear wheels and releases 320 lb-ft. of torque. The Mustang GT is even more powerful for the 2015 generation. The model has a 435 horsepower engine, releasing 400 lb-ft. of torque as well as larger intake and exhaust valves and new intake and exhaust camshafts with increased lift. The new GT is ready to stand against the BMW M4 while providing a unique and unforgettable driving experience. 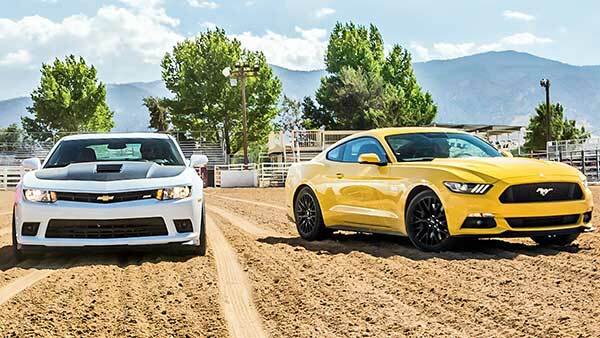 Since these two pony cars have been around for a long time, many have heard of the existing rivalry between them and have tried to figure out which one is best. My opinion is that they are both impressive cars and, from a driver’s perspective, they have never been better than the current versions. Both cars have more than 420 horsepower and six-speed manual transmission. The Mustang’s Performance Pack comes with a Brembo brake upgrade, larger anti-roll bars, larger radiator, new springs, and bigger wheels and tires. The 1LE package for the Camaro SS adds new dampers, larger anti-roll bars, and other elements from the ZL1. From a technical point of view, the Camaro seems to be a winner. The SS’s differential is more aggressive, having 3.91 gears vs. Mustang’s 3.73, which allows the car to put more power to the ground. The Mustang’s V8 engine measures 5.0 liters while the Camaro’s is a 6.2-liter engine. Last but not least, the Camaro creates 426 lb-ft of torque, while the Mustang releases 400. When it comes to pricing, the 2015 Mustang GT is a brand new car that starts at USD 32,925, while the 2015 SS is one of the last Camaros built on GM’s Zeta platform and starts at USD 34,500. In the end, when choosing between a GT and an SS, it all comes down to the car you’ve always loved. If you’ve always been a Ford fan, you will most definitely choose the 2015 GT. On the other hand, if Chevrolet has been your favourite, you will go for the SS. Whichever you choose, be sure that they will provide a unique driving experience. These are two must-haves for all muscle car lovers. The two cars look fast and powerful even when stopped at a red light. While the 2015 Ford Mustang Coupe has a V6 engine and comes with a choice of two transmissions (manual and automatic), the 2015 Dodge Challenger SXT has only standard automatic transmission for its V6 engine. However, the Challenger comes with different options including two 20 inch wheel packages, high performance tires and a power sunroof that one cannot get in the base model Mustang. Additionally, the 2015 Challenger has other equipment packages that aren’t provided with the base model Mustang. These include the following: a Cold Weather Group package that adds heated seats and a heated steering wheel as well as a 6-speed premium sound system; the Super Sport package that adds 20 inch wheels, all season performance tires, and steering wheel mounted paddle shifters; and the Super Track Pak which further enhances the performance with 20 inch wheels, high performance brakes, performance steering, performance suspension and other. There is also a driver convenience package that adds functionalities including cross path detection, blind spot monitoring, parking assist and a remote start system. When it comes to power, the Challenger SRT comes with a 6.2-liter Hemi that gives 470 horsepower and 470 lb-ft of torque, making it more powerful than the 2015 Ford Mustang GT. However, the 2015 Mustang has a more refined and modern look while the Challenger has the appearance of a retro-themed touring car. It depends on what you are looking for. If modern looks are important to you in a muscle car, then, surely, you will opt for the 2015 Ford Mustang. If you are one of the traditional muscle car drivers, the Challenger is the right pick for you. Comparing a US supercar with a German one is a tough thing to do, since the mentality and the expectations are very different in the US, as opposed to Germany. The US buyer is looking for a fast car, to which he can apply all sorts of tuning elements and allows him to do smoky burnouts. On the other hand, The German buyer is a more traditional and somewhat conservative person. He wants a fast and, at the same time, luxurious car. When it comes to speed, both the 2015 Ford Mustang GT and the 2015 BMW M4 are fast. The GT makes 435 horsepower and 400 lb-ft of torque, which is an upgrade of 15 horsepower and 10 lb-ft from the previous model. 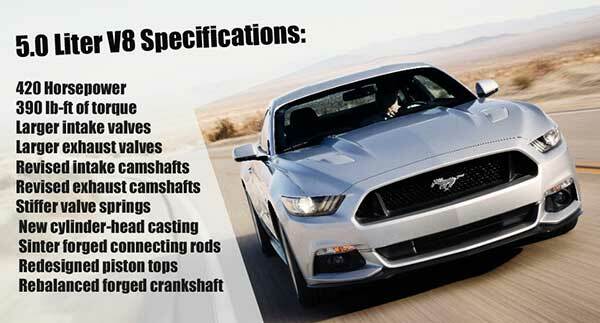 For the extra power, the 2015 Mustang uses bigger valves and valve springs from the Boss 302, as well as a higher-lift camshaft and Boss connecting rods and oil cooler. By comparison, the 2015 BMW M4 is powered by a twin-turbo 3.0-liter inline-six which makes 425 horsepower and 406 lb-ft of torque. Is that enough to satisfy your need for speed? I guess you will have to take both to a drive test and see for yourself. However, while you are at the drive test, don’t forget to also take into account the pricing detail. 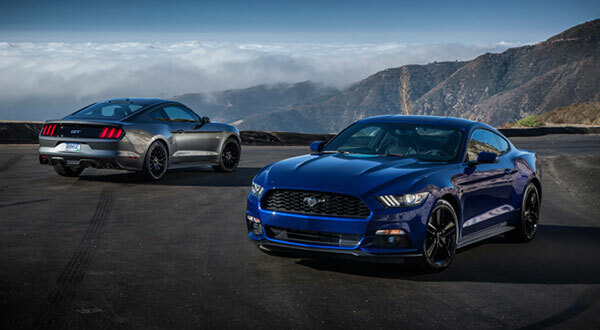 The 2015 Ford Mustang GT starts at USD 32,925, while the 2015 BMW M4 begins at USD 65,125, which is almost double. It’s true that the interior of the M4 is more luxurious but and comes with more functionalities but it won’t come with GT’s standard line-lock feature, which allows it to do smoky burnouts. And that’s the fun part, right?